Alarming increase in level of air pollution has raised awareness among the consumers for environmental friendly product which are carbon free. Also, increasing awareness about the environmental friendly vehicles is likely to influence the demand of the global hybrid cars market in coming years. On the other hand, the government are encouraging the use of the hybrid car in order to minimize the pollution through providing stringent emission standards for the car and also provides several incentives to the buys to support the growth. Highly expensive price of the car and easy availability of the hybrid car is another factor propelling the growth of this market in near future. Strict implementation of policy is one of the important aspect driving growth. Also, high cost involved in the production of the hybrid car is one the key challenge faced by the manufactures operating in the hybrid car market. Imposing stringent rule and regulation for setting the standard of the emission is likely to exhibits lucrative opportunities for the key players. The manufacturers are highly focused toward the research and development activities to enhance the technology capability in this market. Increasing government initiative toward installation of the electric charging station is another factor boosting the growth of the market in coming years. The global hybrid car market is categorized into plug-in hybrid, series parallel hybrid cars, and the series hybrid. Of these segment, demand of the series parallel hybrid dominates the market in terms of demand. The overall scenario of this market likely to remain same over the coming years. Moreover, plug in hybrid cars is likely to register significant growth in terms of demand and the consumer awareness about the efficiency of the plug in hybrid cars. In addition, government initiatives toward the tax incentives is likely to propel the demand of this market in near future. On the basis of geography, Asia Pacific dominates the market in terms of consumer awareness toward the environmental friendly vehicles. Also, the increasing government support toward the purchase of the hybrid cars in Japan and China, is another factor triggering the growth of this market in coming years. In contrast, the hybrid cars market in Europe and North America expected to register moderate growth rate, as the market attain maturity level in terms of demand. On the other hand, high adoption rate of the fuel cars and electricity cars is another factor driving the growth negatively. The existence of the electricity car, act as the direct substitute of the hybrid cars is likely to impact the growth of this market in near future. On the other hand, rising number of charging booth likely to influence the growth of the global market for hybrid cars. The report also offers few prominent market players operating in the hybrid cars market includes Volkswagen AG, Toyota Motor Corp., Nissan Motor Co. Ltd., Honda Motor Co. Ltd. And Hyundai Motor Co. Hybrid car is an eco-friendly vehicle which consists of combination of gasoline fuel and electric motor with battery pack as energy source. Conventional IC engine is main power source in hybrid car and it is also used to charge the batteries which can be used as an alternative energy source. Asia Pacific dominated the hybrid car market in terms of demand and is anticipated to grow at highest CAGR during the forecast period. High price and availability of electric car as strong is anticipated to hinder the growth of hybrid car. Increase in government support by providing various incentives on purchase of hybrid car and implementation of stringent emission norms across all region to control the air pollution is estimated to offer major opportunities to the hybrid car market during the forecast period. Series-parallel is expected to be major hybrid type during the forecast period, however plug-in hybrid is anticipated to grow at highest CAGR in terms of demand compare to other hybrid types. ICE hybrid contributed the largest share of the energy source type and it is likely to dominate the market in next eight years. In terms of vehicle type, passenger car segment dominated the hybrid car market and is continue to dominate the market during the forecast period with highest CAGR. This report analyzes and forecasts the market for hybrid car market at the global and regional level. The market has been forecast based on volume (Units) and revenue (US$ Mn) from 2016 to 2024, considering 2015 as the base year. The study includes drivers and restraints of the global hybrid cars market. It also covers impact of these drivers and restraints on demand for hybrid cars market during the forecast period. The report also highlights opportunities in the hybrid cars market at the global and regional level. The report includes detailed value chain analysis, which provides a comprehensive view of the global hybrid cars market. Porter’s Five Forces model for the hybrid cars market has also been included to help understand the competitive landscape in the market. The study encompasses market attractiveness analysis, where in hybrid types, energy source and vehicle types are benchmarked based on their market size, growth rate, and general attractiveness. 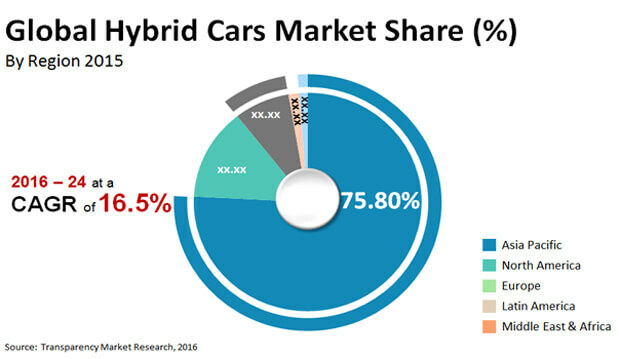 The study provides a decisive view of the global hybrid cars market by segmenting it in terms of type, energy source and vehicle type. In terms of type, hybrid cars is classified as series, parallel, plug-in, series-parallel. In terms of energy source, it is segmented into ICE hybrid, fuel cell hybrid, solar hybrid, natural gas hybrid and by vehicle type it is classified as passenger cars and commercial cars. These segments have been analyzed based on present and future trends. Regional segmentation includes current and forecast demand for hybrid cars in North America, Europe, Asia Pacific, Latin America, and Middle East & Africa. The report provides the actual market size of hybrid cars for 2015 and estimated market size for 2016 with forecast for the next eight years. The global market of hybrid cars has been provided in terms volume and revenue. Market volume has been defined in units and revenue in US$ Mn. Market numbers have been estimated based on type, energy-source and vehicle type of hybrid cars. Market volume and size have been provided in terms of global, regional and country level markets. The report comprises profiles of major companies operating in the global hybrid cars market. Key players in the hybrid cars market are Toyota Motor Corporation, General Motors Company, Hyundai Motor Company, Ford Motor Company, Nissan Motor Company Ltd, Volkswagen AG, BMW, Honda Motor Co., Ltd., and FCA N.V.Market players have been profiled in terms of attributes such as company overview, financial overview, business strategies, and recent developments.